forklift with great efficiency. Available in 2 & 3 ton lift capacity. This universal manhole and cone clamp SVZ-UNI enormously rationalizes transport and installation of manhole elements. 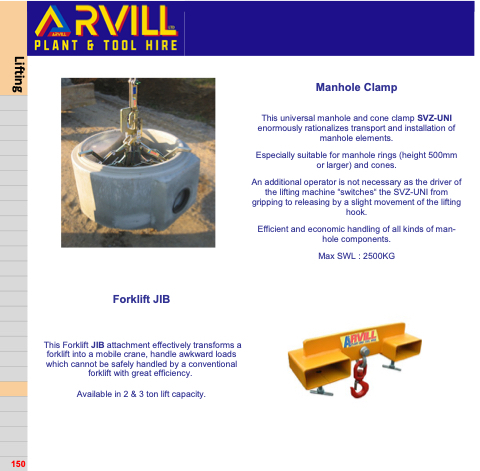 Especially suitable for manhole rings (height 500mm or larger) and cones. An additional operator is not necessary as the driver of the lifting machine “switches“ the SVZ-UNI from gripping to releasing by a slight movement of the lifting hook. Efficient and economic handling of all kinds of man- hole components.